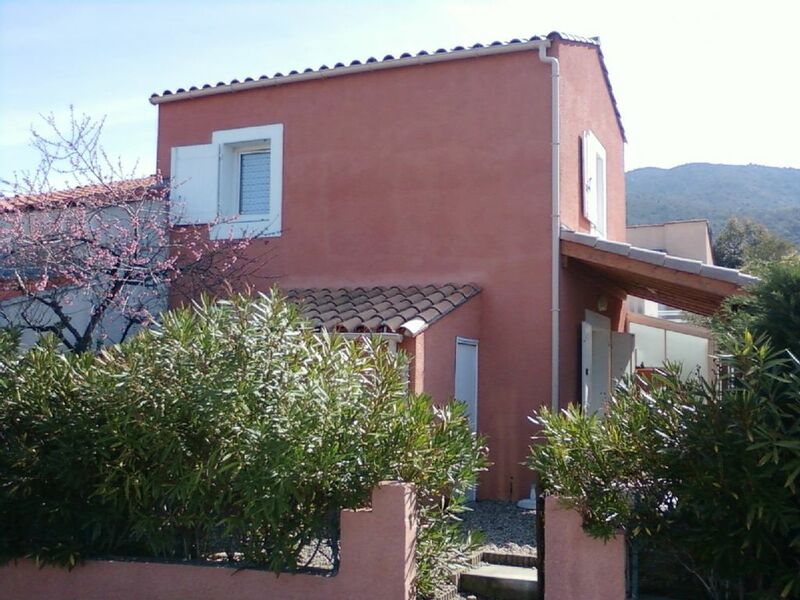 Villa within Sorede village boasting 5 restaurants; cafes and pizza bar. 5 min drive to Argeles Beach. Regular bus timetables available. Relax whilst your children play in the swimming pool, enjoy a game of tennis or simply a romantic stroll up the Pyrenees Mountain. Something for all the family whether you seek a quiet and relaxing break or an adventure with the family. Horse riding, crazy golf, basketball, boules, amusement park and rock pools a short distance away. Entertainment most evenings in the village square just a short stroll away. This villa is a new let and in impeccable order throughout with a front and side garden, open plan lounge and kitchen with separate toilet, 2 large bedrooms and bathrooms upstairs. An outdoor living space allows you to keep a close eye on the children whilst they swim in the pool or play tennis. Satellite TV with all main British Channels. 20 min from Perpignan Airport, 1 hr from Girona Airport & 1.5 hours from Barcelona. Ski Resort: This property is approx 1.5 hours drive to Font Romeu Ski Resort and 2.5 hours drive from Andora Ski Resorts. Golfing: This property is approx 1/2 from Peralada Golf Club in St Cyprien. Other Attractions: 10 minutes drive to beach and port. 20 minutes drive to Spanish Boarder. 2 hours drive to Barcelona. 1 hour drive to Costa Brava. Trains, buses and boats all readily available also. Tourist Information Centre within Sorede Village with full listings of bus time tables and entertainment dates. Upstairs bathroom with bath, shower, sink and storage units. Painted walls and tiled floors make the bathroom tidy and easily cleaned. Separate WC. The villa comes with free wifi. Terrace and covered patio area, suitable for outside dining and smoking. Beautiful peach tree, plentiful for all guests to enjoy whilst in season. The villa overlooks the communal pool and Tennis court. Child friendly, secure private complex within a vibrant Catalan village. Shed at side of villa to secure prams, bikes and sun loungers, etc. Private car parking available. The house has a sheltered area for people to smoke however, we appreciate that all guests enjoy a non-smoking environment therefore smoking, should be restricted to this sheltered area. We stayed for 5 nights in this lovely apartment. We had everything at our doorstep from pool, tennis court, outdoor sitting area and quaint little village atmosphere. The kids loved the pool and we were lucky enough to have a pool attendant there who looked out for our children and was very friendly. The apartment was well stocked with everything we needed, sheets, towels, bedding and even some beer left in the fridge for us. It is also well situated for visiting the beach which was a 15 minute drive. The apartment was good value for money, although probably more directed for a maximum of 5 people not 6. There are two bedrooms, one with a double bed and the second with bunks and a fold out couch bed which our teenage daughter found very comfortable. The 6th bed was under the stairs in the lounge/dining/kitchen. Otherwise a great little getaway apartment ! Had a week at the end of August this year. The villa is on a private estate with use of pool and tennis court. The pool is straight across the road so no walking involved !! Plus you don't really get much noise as it's not usually that busy. No problem getting on the tennis courts - they have a system which allows everyone the chance to play. Sorede is a lovely town - the centre is at most a leasurely 15 minute stroll - and that's all we did because it was hot. There are about 4 restaurants in the town plus a pizzeria with a lovely terrace out the back and it also does takeaways. Also there are a couple of bakers, a butchers and a small supermarket. Went to the market on Friday - very small but sold everything you'd expect. Bigger supermarket Are a 10 minute drive to Carrefour or Supermarche. Good Lidl in Argeles with about the best selection of bread I have come across!!! Argeles is about a 10 minute drive. All in all we had a fabulous week and the villa is ideally situated for exploring the area (which, by the way, is lovely). Tara is great and very helpful. We had a problem with the bathroom light which for some reason stopped working but she had it fixed the next day - excellent service. Would recommend. My wife and I have just returned home after eight days at this excellent two bedroom villa. It was well equipped, clean, in very good condition and can sleep four/five people (seven at a push). There is a medium sized, covered outdoor patio directly outside the main lounge area with a table and chairs for 6/7 people. It's quite private and not generally overlooked. Two sunbeds and a barbecue were also supplied. The swimming pool and tennis court are close by and whilst you can hear the kids having a good time it was never loud enough to bother us. The toilet is downstairs with a bath/shower room upstairs. The compact, open plan kitchen, adjacent to the lounge, is well equipped. It has a washing machine and excellent fridge/freezer. Sorede village is lovely and only a 10 minute walk from the villa. It has a good selection of restaurants and bars plus a small market every Tuesday. A large Carrefour supermarket is a ten minute drive. Good hiking trails can be accessed directly from the villa and an excellent beach (Le Racou) is only a 15/20 minute drive away. The area around the villa is quiet with relatively light traffic and has some great views. If you're looking for a relaxing, good value, self-catering style holiday, here is a place to enjoy. And yes, we'd definitely go back. We (myself, my husband and two boys) had the pleasure of staying here for one week in June this year. We couldn't fault it. The house is immaculate inside. Spacious living area with sofas and dining table. We made great use of the washing machine and cooking facilities. Two good sized bedrooms upstairs (our boys loved the bunk beds) and a super clean bathroom with shower. There was also a stair gate upstairs which was comforting as one of our boys is only a year and a half. We all loved the pool just a stone's throw away. There are tennis courts too but we didn't get a chance to use them. We went to the beach every day, it was only a ten minutes drive. Same for the supermarket which had everything we needed. We only ventured into the village one night for dinner and it was extremely good. The village itself is very pretty. The house offers plenty of clean, fresh towels and bed linen which was really useful. We ate breakfast every morning on the patio area which remains cool and shaded throughout the day and is a welcome break from the hot sun. The weather was amazing our whole week there. The whole area is just stunning. We would love to go back! Loved this holiday. Short walk to village where we enjoyed many lovely meals. Restaurants were child friendly. Choice of finer dining or more relaxed food in cafe and a pizzeria. Little supermarket and bakery for essentials. Even a hairdressers if needed. Weather was fab every day. Very close to neighbouring villages and towns with a different market on every single day of the week. Loved the beaches; Collioure, Argeles and Canet but our favourite was Racou. Wish we had more time to visit the many other beaches. Absolutely loved Sorede and local people were lovely and friendly. Loved Collioure nearby. The pool as directly in front of the villa which and tennis courts were available if your children were old enough. Ours are 5, 7 and 9 so maybe in a few years. Villa itself was clean, bright and had all the things we needed. Washing machine was handy so we went home with clean clothes. Towels and linen were free which on other adverts were charged extra. We were hesitant initially as there was a negative review but were assured by owner and to be honest, I never write reviews but owner requested a review and couldn't fault our entire experience from booking right through to holiday and our deposit returned promptly. Would definitely recommend and would go back again. Just sorry it's all over!! We stayed in Tara's house 2 years in succession. The house was great - everything you needed and convenient to the village and to the beaches. Would recommend a visit. Situated 6km from the Sea and Beaches within a beautiful Catalan village on the foot of the Alberes. Close to towns of Collioure and Ceret famous for Dali, Matisse and Picasso. Close to large sea - side resort of Argeles, with lots of activities including Fun Parks. Beautiful village with lots of life and musical events during summer. Area of outstanding beauty with excellent hill walks. 20 minutes from Perpignan and 1 hour to Gerona close to the Spanish border and 1hour 45 minutes drive to Barcelona. 50% deposit of rent is required to confirm the booking. Remainder of rent should be paid 4 weeks before arrival. €200 refundable damage deposit. Fully refunded upon departure. In the event of broken crockery, please just replace the item.